This 1992 Gibsea Master 522 is powered by a Perkins M90 84hp diesel engine. She benefits from new PSS, shaft and coupling. She also features an Auto stream feathering prop. ‘Intermezzo’ the Gibsea Master 522 is fully equipped and ready to sail with electric in-mast furling main (new), furling staysail, furling genoa 160%, 200sqm MPS/asymmetric spinnaker in sock. She also has a spare mainsail. 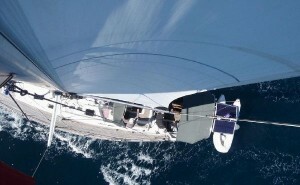 Her in-mast furling main and furling genoa setup has been designed to allow ‘Intermezzo’ to be sailed single- or short-handed. Fully decked in teak ‘Intermezzo’ provides a centre cockpit with U-shaped bench seat, cockpit cushions and optional cockpit table. The running rigging is lead around the centre cockpit with a dodger to the aft-cockpit helm position, allowing those in the centre cockpit to relax whilst sailing. The aft-cockpit features further bench seating around a central helm position. Harken Barbarossa deck gear is setup to be easily accessible from the helm for short- or single-handed sailing. There is also a barbeque in the aft cockpit. The sugar-scoop design of the aft of this Gibsea 522 means that access to the water and tender via the bathing platform and ladder is easy. The dinghy davits also allow storage and stress-free launching of the tender. Plentiful storage is also provided on deck with two large lazarettes at the stern and a huge forecastle at the bow which has more than 2m of headroom. Inside, this Gibsea 522 provides ample space down below thanks to her 4.7m beam, this allows her layout to benefit from a large saloon area perfect for entertaining, as well as practical navigation area and further bench seating with a table. The galley on ‘Intermezzo’ is streamlined and user-friendly, featuring twin sinks, with salt water pump and fresh and filtered fresh water on tap. Her top loading fridge is built into the work bench top and there is also a freezer found in the saloon which cleverly doubles as an extra table. The galley in this Gibsea Master 522 also benefits from a gas oven with 4 burner hob and a microwave conveniently tucked away. This Gibsea Master 522 accommodates 6 within 3 large double cabins with ensuite bathrooms. Forward of the mast is a large presidential suite with king-size bed, cupboards and side lockers. The is also a separate heads and large shower room. To aft are two further staterooms, each with a large double bed and ensuite bathroom. The deck and safety equipment aboard this Gibsea Master 522 includes: Harken Barbarossa deck gear; Bruce anchor; Plough anchor; Sand anchor; 13mm chain; Goiet windlass; dinghy davits; solar panels; stainless steel barbeque; 406 EPIRB; life rings; 6 man life raft; Dan buoy; Jon buoy; and lifejackets. This Gibsea Master 522 comes well equipped with the following navigation instruments and electronics: wind data and autopilot; chart plotter; GPS; radar; AIS; satellite phone; VHF; new flat screen TV; phone booster antenna; stereo with Bose speakers; 400W solar panel; 6.5KVA Onan genset (recent overhaul); new Centurion battery charger; inverter; shore power; and 600AH AGM batteries. This Gibsea Master 522 also comes equipped with a new Sirocco 3m RIB tender and a 15hp Yamaha outboard which is stored on davits at the stern.